Do you know the best diet for Cockatiels? Which foods should you avoid and what can you give them as a treat? 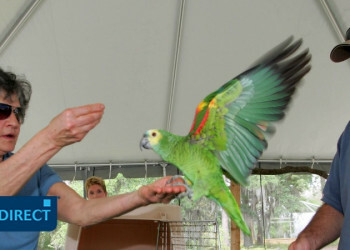 Thanks to Dot Schwarz, parrot owner, writer and expert who provided the research for this article. Did you know that you can tell the emotional state of a Cockatiel from its distinctive erectile crest? When a Cockatiel is excited or startled, the crest becomes dramatically vertical. It remains at a gentle angle when in a neutral or relaxed state; but when angry or defensive it becomes flattened close to the head. Cockatiels are one of the most popular pet parrots. They’re native to mainland Australia and are the smallest of the Cockatoos standing at (30 – 33cm). When looked after well in captivity, they can live on average between 10 - 14 years but some have been known to live until the age of 20 and beyond. They’re known for their distinctive colouring. Male and female Cockatiels look the same when young but once they become adults it’s easy to spot the difference. Males have yellow feathers on their faces which spread into the crests. Both sexes have orange cheek patches, but males have a brighter orange colouring. They are intelligent and inquisitive birds, who enjoy singing and head bobbing dances. They can be taught to whistle to songs and perform tricks like flips, handshakes, fly-on-command, and showing their wings. Cockatiels can be housed indoors in a large wire cage with a plastic base or outdoors in a purpose-built aviary. They are social birds and prefer company so it’s a good idea to keep them in pairs or larger groups if possible. If you intend to keep Cockatiels indoors, they will need regular daily exercise outside their cages and human interaction. The cage and all its components (perches, water bowls and toys) should be cleaned regularly and be kept free of any decaying food. This will help keep bacteria levels down and prevent illness. Along with regular exercise, Cockatiels need a good balanced diet to remain fit and healthy. In their native Australia, they eat a variety of seeds (grass seeds), fresh and dry nuts, berries and vegetation. The UK has a different type of grass, but Cockatiels can still be fed a seed diet along with fruit, vegetables and occasionally human food. Should I feed my Cockatiel pellets or seeds? At least two-thirds of a Cockatiel’s diet will include seeds or pellets. The rest should be made up of various fresh food. Some owners prefer seeds because they seem more natural. However, it’s important to understand that seeds are lacking in calcium and vitamins. An all-seed diet cannot provide Cockatiels with everything they need in their diet. This helps explain the popularity of supplements which give Cockatiels the calcium they need. Most vets accept that modern pellets are formulated to give the correct amount of minerals and vitamins for birds and many owners prefer pellets for this reason. If you buy a Cockatiel from a reputable breeder, he or she will share advice on what to feed them. If your breeder was feeding principally seeds and you want to convert to pellets, you can do that with support from an expert. A just weaned hand fed chick will adapt to pellets more easily than a mature bird. What fruit and vegetables can Cockatiels eat? Sprouting seeds is a popular option to feed Cockatiels a healthy and nutritional meal. In the wild, they feast on freshly harvested pods, nuts, fruits, legumes, flowers and seeds. These can be described as live foods. When kept in captivity, foods eaten by birds are primarily processed or bought a few days after harvest. Sprouting seeds helps replicate this natural diet. It involves burning off the fat found in seeds that gives them the energy to turn into plants. Once the fat is burned off, they’re transformed into live, highly nutritious food - beneficial for many birds. They’re especially valuable during the winter when good fresh vegetables are in short supply. Sprouting is easy to learn and can help save money. Using basic equipment such as an electric sprouter along with organic sprout mix, will let you begin kitchen farming immediately. For pet owners who enjoy walks in the great outdoors, you can find lots of nutritious foods that are good for Cockatiels. Dandelions, chickweed, dock, and young nettles are good options. Berries that garden birds eat like cotoneaster, hawthorn can also be enjoyed by Cockatiels. What can Cockatiels not eat? Processed foods generally contain additives that are not healthy for avian species. If your Cockatiel flies down to your plate and flies off with a slice of cake, pizza or potato, this behaviour should not be encouraged; but it’s unlikely they will suffer serious ill health by eating one piece of unsuitable food. If you want to reward your Cockatiel with a treat whilst training them, it’s best to give them food they really want. Recommended treats include: a sliver of nut, peanuts or sunflower. How often should you feed Cockatiels? The amount needed for a mature cockatiel of seed or pellets will generally be 1.5 to 2 level Tablespoons (30 - 40 grams) a day. Some owners often like to provide lunch for their Cockatiels. This is fine as long as the total amount fed per day isn’t exceeded. In the wild, Cockatiels eat in the morning and early evening. They rest during the middle of the day before going to sleep just after sunset. They roost communally. Cockatiels kept as family pets will spend more time out of their cage during the evening with their owners and this means an adjustment to their body clocks. Adult birds are good at adapting to this, but young birds need at least 10 -12 hours of rest in a quiet darkened environment. This should be taken into account in terms of feeding times. Alongside a good nutritional diet, water and general hygiene are very important. Tap water is acceptable in most households, although access to spring water is beneficial. 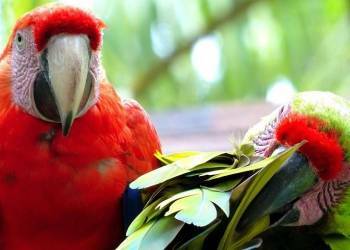 Water bowls are a health hazard both in cages and aviaries if they are not changed daily. Fungus and bacteria can flourish in stagnant water and in seed bowls if not changed every day. It is up to owners to decide whether they want to use commercial disinfectant, bleach or hot soap water to clean bowls. The most important thing is that bowls and dishes are cleaned every day. Why has my Cockatiel stopped eating food? If your Cockatiel stops eating it’s usually a sign of stress or illness. Some owners find that after buying a new Cockatiel from a pet store, they stop eating. Cockatiels can become stressed if they find themselves in unfamiliar surroundings and they will need time to adjust. Cockatiels can also be fussy eaters and quickly become accustomed to particular feeds. It’s important for new owners to continue feeding them the same food they were eating at the store before introducing them to new foods. One way of checking if a Cockatiel is healthy or not is by examining its droppings. Healthy droppings have a solid greenish curl or coil surrounded by a splash or white urates and some liquid urine. If you notice that droppings are watery, a different colour, deep green, bloody or changed in consistency, it’s a sign the bird is unwell. What does a healthy Cockatiel look like? A healthy bird is bright eyed and active. Feathers are smooth and glossy, and their stance is upright. It’s normal for many Cockatiels to sleep with their heads tucked under one wing but if this takes place for several hours during the day-time it is a sign that they are unwell. If their feathers are fluffed up during the day or they are sitting at the bottom of their cage, this is another sign they are unwell. To keep your Cockatiel happy and healthy, their staple diet should include pellets supplemented with lots of fruit, vegetables and seeds thrown in now and again for variety. This will ensure they are getting all the vitamins, minerals and nutrients needed. If you have any concerns or worries about the diet you are feeding your Cockatiel, you should always speak with a reputable breeder or see an Avian vet who specialises in treatment of birds. 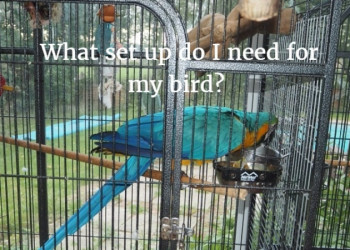 How to setup a parrot cage - buying a cage, size, location, food, cleaning, perches and more.